- 10 % discount until 30 April 2018! 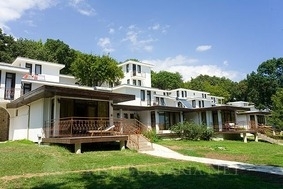 Location: Russalka holiday village is located 90 km northeast of Varna and it is situated in the nature reserve Tauk Liman, amidst a picturesque oak forest, near the popular national historic reserves of Yailata and Cape Kaliakra. Accommodation: Russalka holiday Club offers over 600 small bungalows with two or three bed rooms and a private WC. Some are linked with a connecting door and are suitable for families with children. Dine: All restaurants in the village are known for their superb cuisine. There are many restaurants as Russalka and Taukliman (view over the peak Kaliakra), taverns and bars. Sport & entertainment facilities include 15 tennis courts, mini-football and volleyball fields, table tennis, yacht and kayak club, scuba diving school, archery, riding ground, outdoor swimming pool, anti-stress and rehabilitation centers, kindergarten and night clubs. There is outdoor swimming pool, Jacuzzi, security car parking at guests' disposal as well. - Tennis courts; Archery; Table tennis; Volleyball and basketball playground; Mini football; Kanu kayak; - Children club, kid`s playground, Animation. Safe on the Reception, internet, Tennis school, gym, Horse riding school, Diving school, Powerboat, Fishing, Hairdresser’s, Laundry, Art Club, Massage, sauna, beauty studio, Tennis courts (soft).